A much anticipated addition, all thanks to the aforementioned CoreLibs integration. For the uninitiated, Stealth Mode module is responsible for protecting your privacy. Use it in conjunction with Tracking Protection filter to ensure the best protection. Also mind that different Stealth Mode options differ in their severity, some are “free”, and some come with certain trade-offs in convenience. When in doubt, read the tooltips or even send us a message with a question. One of the most expected, and at the same time controversial changes, for sure. We were debating whether to put “Changed” or “improved” tag on this one, and decided for the latter. We wholeheartedly believe that the new variant is better than the old one. Our designers spent countless hours on it, going through many iterations, and this is where we finally arrived. As you will notice very soon, we changed not only colors but the layout too. For seasoned AdGuard veterans, it will take some getting used to, but we are sure you’ll find the new design even better and more convenient after a while. And before you say “But I was hoping for the dark theme!” — don’t worry, it is also available. Looks not a single bit less slick than the default one. Statistics are useful, it’s always nice to know how many ads were blocked, how much traffic was saved and so on. But simply looking at bland numbers is not very informative, and also plain boring. Charts both provide more information and are much more comprehensive. If you are reading this, likely you don’t need any suggestions and you can navigate AdGuard’s options with ease. But for new and less experienced users this will be a helpful addition. Upon the first launch, the wizard will tell you about available features and suggest turning them on. There are, in fact, several different improvements hiding under one. Instead of bundling with the dnscrypt-proxy binaries, we are now using our own DNS proxy server that supports all existing DNS protocols. But enough of this gobbledygook, what does it mean for you, the user? To configure a DNS-over-HTTPS (another secure DNS protocol) server, you don’t need to know the SDNS and can use a simple string like https://dns.adguard.com/dns-query. Indicate any number of upstream servers for your custom DNS server setup. …and if it is still not there, no big deal! Just add it manually, because now doing it is extremely easy. Just tap the respective button, enter the filter list’s URL, and it will appear among the rest of the filters. New filter will be updated automatically, and of course, you can add more than one at a time. And again, a feature mostly aimed at newer users. 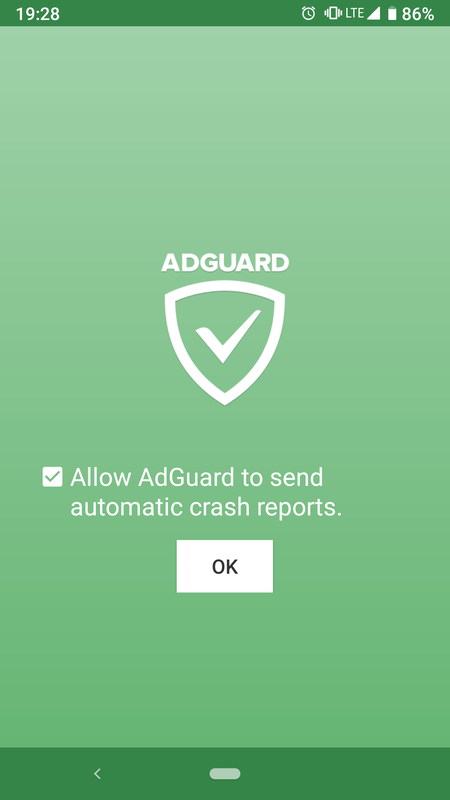 AdGuard for Android accumulated quite a bit of features over the years, and it is not easy to identify from the get-go which are the most important. This new tab draws your attention right on the main screen and hints at which steps can be taken to enhance your protection. We know it’s unusual for us to push an update directly to release channel, but this time we decided to do so nontheless. What was planned to be a quick hotfix, turned out to be an update that touches on several different issues. Nobody likes to roll out a hotfix just a week after the release, but sometimes there's no other choice. We took this opportunity to not only fix the problem but also to update the CoreLibs filtering engine and make a handful of other useful changes. Turned out, on some older devices (Android 6 and older) AdGuard didn"t restart after the protection got paused automatically (say, on the network state change). This affected a large enough portion of AdGuard users to justify an immediate update. We have been working hard on integration with CoreLibs for a long time, and we are extremely proud and happy to finally switch to it. The importance of it has been mentioned before multiple times, including a post in our Blog. We recommend reading it for more details, but if you only want a brief summary, here it is: CoreLibs is a cross-platform filtering engine that will substitute previously used platform-specific engines. Thanks to it, the performance rate will increase drastically (twofold for AG for Android, according to our tests!). The unified filtering engine also means shorter development cycles, we no more need to account for the nuances of this or that OS. And finally, many features that only existed for one OS can now be easilly transfered to AG products for other platforms. So expect things like Stealth Mode on Android! > A note — you can drag any of these options to create a widget. Hopefully, you’ve already had a chance to test the new tasker API. This beta will give you something new to play with: proxy settings. Two new actions become available: `proxy_state` and `proxy_default`. The first one enables/disables the outbound proxy, the latter sets any of the previously configured proxies as default. More detailed description of these actions is in our KB article. A somewhat "unexpected" AdGuard for Android update — much smaller than a usual one. It contains a couple of hotfixes, which were basically the reason to release this version, alongside several quality of life improvements like separate WiFi/Mobile statistics in "Apps Management". A self-explanatory one. There was an annoying bug with "Wakelock" that prevented the device from entering sleeping mode. A couple of serious bugs have been fixed: misbehaving “Protection” button on Android 7, certificate detection issue and “broken” whitelist. You’ll find a lot of minor fixes too, plus updated translations. The AOT (ahead-of-time) compilation method on Android 7.x could remove whole chunks of AdGuard code on its optimization step. This led to various problems, including the persistence of VPN connection despite the disabled protection. We have changed the algorithm of user certificate detection and it now works more correctly. Hi everyone! AdGuard for Android has always been one of the most rapidly evolving AdGuard products, and it stays that way. Today, we introduce to you the new version, featuring some of the biggest and potentially the most important changes in a while: significant increase of the filtering speed, outgoing proxy and TOR support, DNS filtering, DNS encryption and everything cool that goes alongside it. More details ahead! Historically, questions about AdGuard battery usage are among the most frequently asked ones. Sadly, Android distorts the battery consumption breakdown, attributing other apps' traffic and battery consumption to AdGuard. We've even written a detailed knowledgebase article that explains this issue. To mitigate the misconception, we added a new screen called 'Battery usage'. You can access it by tapping on the battery icon in the top right corner of the main screen. Inside you will find a chart that shows the AdGuard battery resource consumption within the last 24 hours, with an option to get more detailed hour-to-hour data by tapping on the dots on the chart. Besides that, there's also a numeric breakdown of the relevant data and a short technical explanation. The new version is not excessively rich with new additions and other changes - more will come in v2.10 and, eventually, in Adguard v3.0. However, there is still one big highlight - we have vastly reworked and improved the User filter. Read below to find out the details. As you will see, we have combined all of the control elements - add a new rule, clear the filter, edit the filter, import and export - under one toolbar menu. This is arguably the biggest we've changed our app since v2.5 or even since the introduction of the new design back in Adguard v2.0. Some of these changes were meant to be introduced only in the 3.0 version, but we couldn't wait any longer :) Significant changes to UI, the long hoped-for filtering log feature, other new options - all this and much more awaits you in this update. Oh, boy. Anyone who has ever tried to check what's being filtered/blocked knows the struggle of inspecting Adguard's log file. It was the only way, and I doubt there is a single user who found it convenient. No surprise, as it was initially meant to be used by filters developers only. We were thinking: 'Why would anyone want to see on such deep level what do their apps do?'. We had been completely ignoring tech savvy people who do care about it and do want to have a complete control of what is going on on their device. It hasn't been long since we have released an urgent hotfix for Adguard v2.8, and today there is going to be another one. It is not normal when such things happen, we realize it, and want to apologize to all of you. We'll do our best to avoid such situations in future. The most major fixed problem concerns one of the low-level settings - pref.vpn.ipv4.bypass, which, as the name suggests, allows to disable filtering for all ipv4 traffic. It was simply missing in the latest release version. Along with the problem mentioned above, a couple of other issues were addressed. This bug affected Adguard's work in WiFi networks and could lead to several problems, such as: no filtering fore some websites, local network FTP-server disability, incorrect functioning of WiFi calling feature. Finally, it's time for Adguard for Android 2.8 to come to light! It brings the ad blocking quality to the next level with several big novelties such as Simplified domain names filter or extended CSS support. Many new low-level settings will allow advanced users to customize app to their liking, and for all the rest we bring quite a few quality of life improvements and bugfixes. 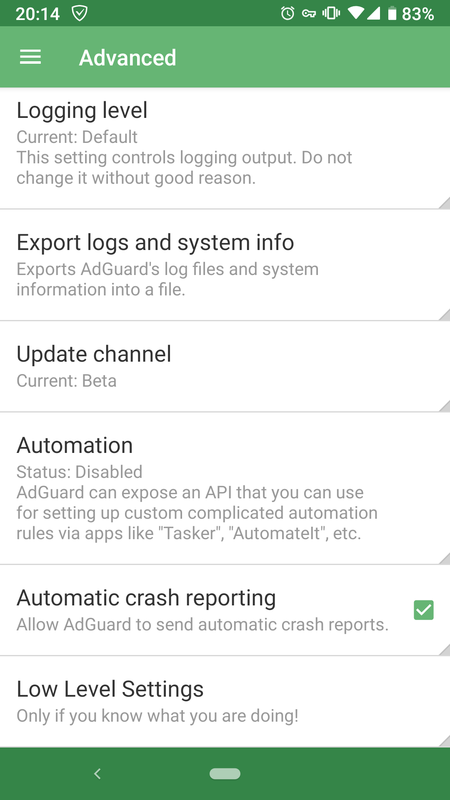 We hope everyone finds something useful in the new Adguard for Android version. Fresh addition to the Adguard filters family. Simplified domain names filter is composed of several filters (English filter, Social media filter, Spyware filter, Mobile ads filter, EasyList and EasyPrivacy), modified for better DNS filtering. It blocks ads and trackers wherever it is possible to indicate own DNS addresses. Note that it will block the whole domains and not the specific URLs. You can learn more about DNS blocking by visiting our website adguard.com. This option will allow rooted users to automate removing Youtube app data, which appears to be crucial for blocking ads in it. By the way, in one of the recent articles in our blog you can find a detailed guide to blocking ads in YouTube app. If this option is enabled, Adguard will ignore all IPv4 connections. This might appear wierd and unnecessary, but in reality it allows to use Adguard as a 'DNS-level' ad blocker. You only need to enable the following options: pref.vpn.ipv4.bypass, pref.vpn.ipv6.bypass, DNS requests filtering and Adguard DNS filter (the latter is not crucial, but will help immensely with blocking ads in browsers). Adguard will cease filtering other apps' traffic, and will only block ad domains on the DNS requests level. As a result, ad blocking quality will drop and Firewall functionality will not be available, but also there will be close to zero performance penalty. Lots of other minor issues and compatibility fixes. The full list can be found in our GitHub repository inside the descriptions of previous beta versions. It has a little bit for everyone. If you like to have everything under control and customize filtering for every app, check out new settings section - 'Apps & Statistics'. It is much easier now to make your apps behave exactly as you want them to. For custom filter rules enthusiasts we have a new modifier: $app. Create rules that affect only one specific app, or all other apps except for it. 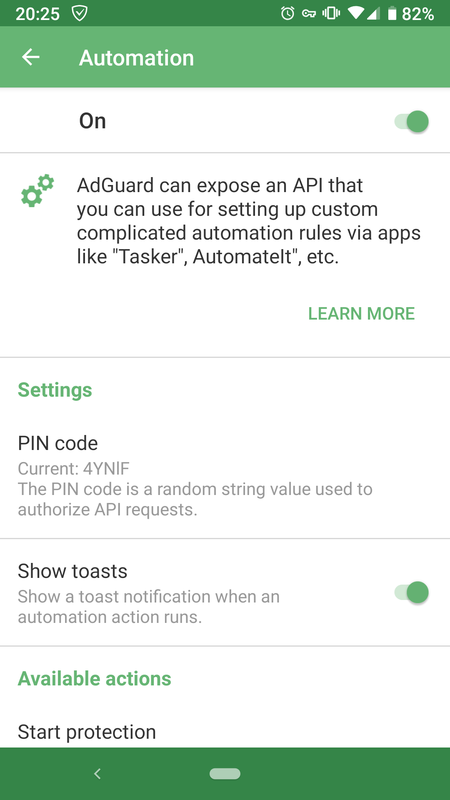 Those who use Android N devices will save a lot of nerves now - new version of Adguard automatically detects if an app is created specifically for Android N, which allows to avoid many problems (this affects some other potentially problematic apps too). And everybody will notice a general increase in quality. Many bugs were fixed, many useful changes were made. All details are in the changelog below. You will find quite a lot of improvements and new features there. Last version introduced HTTPs filtering, and in this one we made it faster by A LOT :) Now it is so much faster and more stable. Also, our users get the ability to configure which DNS servers to use with DNS filtering, compatibility with other apps is improved, UI unergoes some tweaks, new filters are added to make filtering more comfortable... and much more! With Adguard you can now override system DNS settings and use any DNS servers you like. 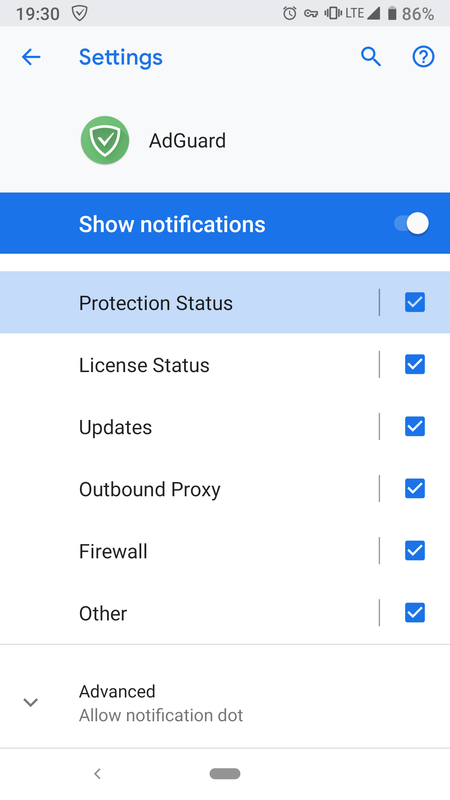 Just as with proxy settings, Android does not allow you to do it when you are on mobile data, so Adguard is your only option. To do it: go to Settings - Advanced - Low-level settings - tap pref.vpn.dns and enter preferred DNS servers addresses (one per line). One of the most asked questions about Adguard is “can I use it with another VPN?”. The usual answer was “no, you can’t have two VPN running together (unless you have root and use AG in proxy mode)”. We are very excited to announce that we have brought a new solution suitable for non-rooted devices. Does this allow you to use two VPNs at the same time? No, unfortunately this is still impossible. However, most popular VPN providers allow you to use proxy instead and that’s what you can do now with Adguard. For instance, if you are a PIA VPN user, you now can setup Adguard to use their SOCKS5 proxy. Learn more about it here (scroll down until you see “SOCKS5 proxy” link). You may want to use TOR along with Adguard and it is also possible now! Here is a short instruction on how to setup Adguard to work with Orbot: Proxy with Tor. Go to Settings - Advanced, open Proxy settings. It appears that in Proxy+Auto mode Adguard cannot filter IPv6 traffic. As a temporary solution we’ve introduced new low-level setting “pref.proxy.block.ipv6” allowing to block IPv6 traffic to public networks. It is disabled by default, so if you have IPv6 offered by your ISP, you may want to enable it. 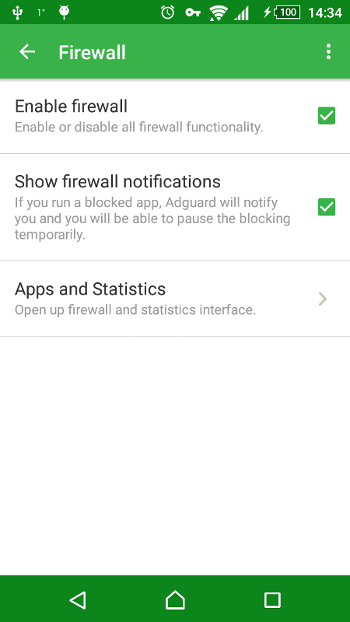 Not so long ago we announced a soon-to-come release of new Adguard for Android version, and we keep our promise by pushing out Adguard 2.5 today. Lots of new features and bugfixes are awaiting you, and some of them are HUGE. If you keep track of our blog, or forum, you already know that the killer news of this release is adding the HTTPS filtering. And yes, that means no more ads in YouTube, Facebook or Twitter - you name it. But there are other reasons to get excited besides it. Read on to find out what are they. Previously, ads which are loaded using HTTPS were ignored. Now Adguard can filter HTTPS protocol, which means that all such ads will be blocked. And these ads appear at many websites and apps - we already mentioned some of them above. To enable HTTPS filtering, simply go to Adguard settings -> HTTPS filtering. Put checkmark besides 'Install certificate' checbox to install certificate, then enable 'Filter HTTPS connections' - all is ready now. 1. You will need to set a password or a lockscreen pattern. This is a system requirement with no workarounds. 2. You will get a 'Network may be monitored' notification after enabling HTTPS filtering and after each device reboot. This notification, however, can be swiped away. From the beginning, the main goal of HTTPS was to secure your data that you transfer via network. We take privacy and security issues very seriously, and that's why we spent a lot of time to make sure you will not lose HTTPS advantages while filtering HTTPS protocol. 1. Your network traffic remains encrypted (because all the filtering happens inside your device). 2. Adguard checks server certificates by itself, and with any hint of danger filtering of this connection will be ceased. 3. Adguard is not affected by any SSL vulnerabilities which year 2015 was so rich of (it can be verified on SSL labs). 4. By default Adguard doesn't filter connections with known bank domains and other websites with personal info. Since this beta we fixed a lot of bugs concerning HTTPS filtering. This change should help with #3. When Adguard pauses protection, sometimes Android may kill it's process and then do not bring it back. 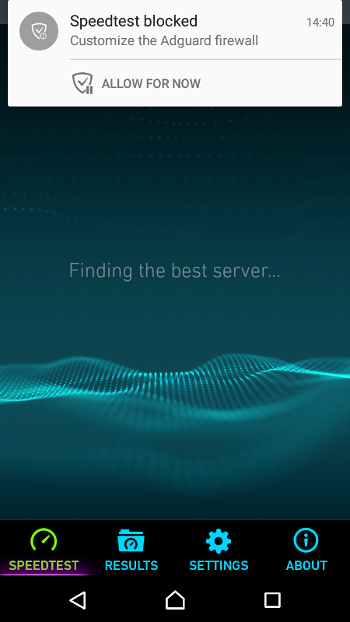 We have improved "Filter DNS requests" feature, now it is much more reliable and works for both Wi-Fi and Mobile connection. This feature may drastically improve the battery usage, so I recommend trying it. Patch for Adguard 2.1. This patch fixes a few major bugs discovered in the previous release. [Added] New low-level setting "pref.net.exclusions". Allows to change the list of apps for which network filtering is disabled. [Fixed] Problem with filtering stuck at detecting filtered app. [Fixed] Cannot download file larger than 2Gb. [Fixed] [Critical] Wakelock when there are semi-closed connections. [Fixed] Compatibility issue with My JDownloader. [Fixed] App crash while checking if app is in foreground. [Fixed] Disabled update check for Amazon build. Previously there were problems with downloading large files, especially from Google Play. It is not the case anymore, you don't have to disable Adguard just to update your favorite app or download a new game. With recent changes Adguard has become faster, more stable and less resourse consuming. It was possible due to optimization of several 'bottleneck' situations. A new preference "pref.vpn.capture" added to low-level settings. If this setting is enabled, Adguard will create the special file named «tun.pcap». It contains all network packets transferred through the VPN. This file is located in the app cache directory, and can be analyzed with the Wireshark program. To find more information and discuss new version, visit our blog. 'Firewall' section added to settings, with an ability to disable it comletely. Added the long-awaited firewall feature. 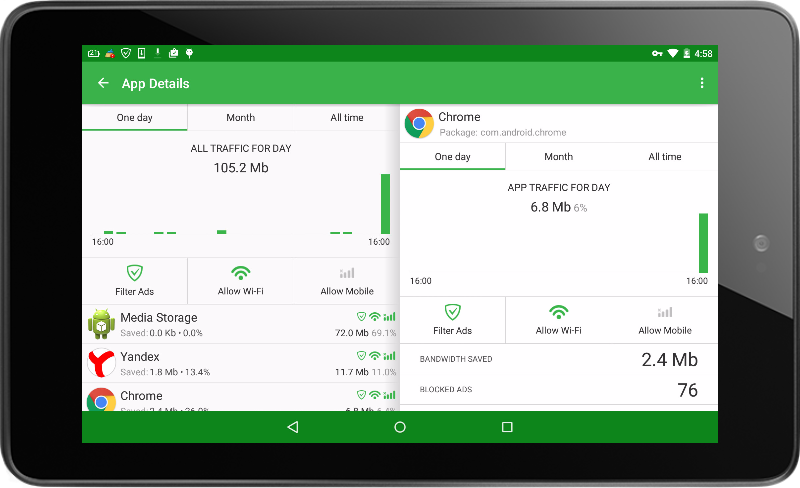 Now it is possible to fully control the internet access of apps in different networks. The apps won’t be able to go online and send any data without you knowing. In addition, by using our firewall, you can allow some apps to go to the network only via mobile Internet, while others (for example, ones that require a lot of traffic) – only through Wi-Fi. Added app traffic monitoring system. You can monitor the consumption of app traffic in real time. Adguard will show you which apps consume resources at the moment, and demonstrate the used traffic for day, month or all-time. Added module for blocking advertising domains by DNS (can be found in advanced settings). DNS filtering consists in Adguard intercepting requests to the DNS server, which let the program know where the particular domain is, at what IP address. If requests to the domain should be blocked, then Adguard returns the special blocking response with a lifetime of 1 hour. During this hour, the program will no longer send requests to the DNS server, so the load will be reduced accordingly. Added IPv6 filtering support. This protocol may not even be supported by your provider yet, and we have already added its support in VPN mode. Just keep using Adguard as if nothing has changed. Implemented blocking of QUIC protocol in Google Chrome. Google servers are working based on it, and also with its help Google Chrome loads banners and text ads. At the moment, the use of this protocol gives no significant advantage to the user, therefore we decided to block this protocol. Added simplified filtering mode without cosmetic rules. It is useful for low-end devices limited by memory and CPU resources. Banners are also wonderfully blocked, but once they are blocked, there will be “holes” that are usually hidden by some cosmetic rules that are present in other modes of filtering. Added the import function for user rules lists from a file. Added widget for your desktop, allowing one-click control for the ad-protection. Added options for update channel - Beta/Release. If you plan on using latest beta updates, don't forget to check the checkbox in advanced settings. Fixed problem with TCP-stack when downloading large files (in Google Play, etc.). Remarkably redesigned UDP and TCP connections handling, which led to the load reduction and increase of concurrent connections number. Use of system Intents to manage the service from other programs (Tasker, etc.) is now allowed. Improved restarting protection after reconnecting to the network. Fixed problem with sending MMS through the Verizon operator. Fixed sending SMS for T-Mobile users. Added support for NoChromo, Chrome Dev, Amazon Silk. Added an exception for new Opera Max, you can now use it with Adguard in proxy mode. Added new icons for different application states. Our notifications became more vivid and informative with new icons of pause, available update, or when a conflicting app is found on the device. No more status bar colored icon option in Lollipop. 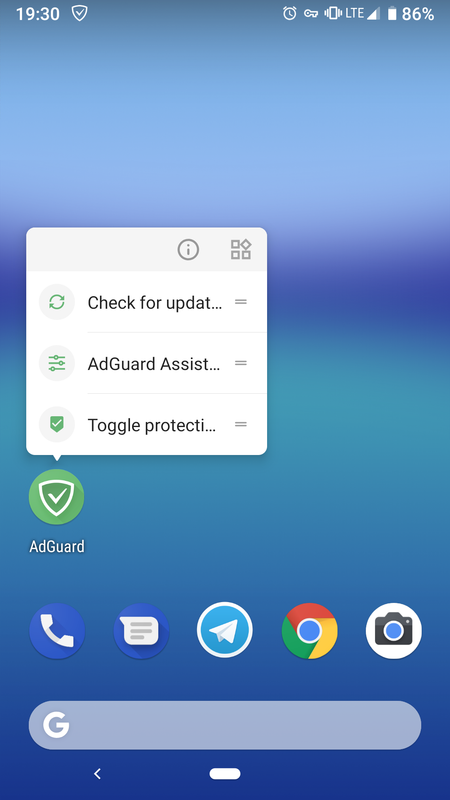 In new Android version Google has released a new design requirements, and when we assembled Adguard for the new system while using new technologies, a color icon was “damaged” by assembly tools. Therefore, we had to abandon the colored icon in the Android Lollipop notification (5.0+). Redesigned interface of user lists. Added new languages and updated existing localization. Many small but important fixes. + Added support of Habit browser and Yandex browser beta. * Google Messenger app added to exclusions list. * Fixed a bug with local network exclusion. Now local network is properly excluded on all devices. This should fix some compatibility issues: working with local FTP servers, Sonos, Amazon Fire TV, etc. * Fixed Adguard filtering in case of using proxy server with port 80. * Fixed UI issue when bandwidth saved value is more than 1GB. * Fixed Google Play Music compatibility issue. * Fixed an issue with waiting for ROOT access on device boot. 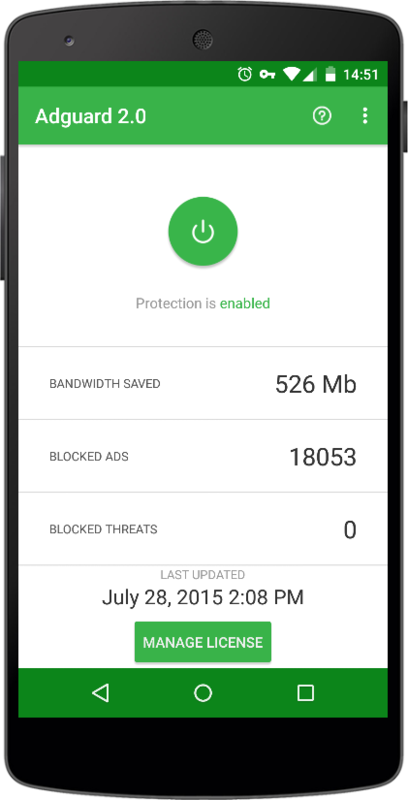 After a month of open beta testing, we finally announce the first official release of Adguard for Android. Many thanks to all who helped us in testing the app. Thanks to you, we have fixed more than 100 bugs for the last month!